This featherweight Elegance Barocco designer Mask in gold is a Venetian gem. It is a product of dedicated Venetian master craftsmen, keeping alive the 16th century carnival tradition and skills. 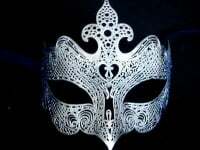 Today, when choosing the distinctively different Barocca Filigree Mask you bring the history and mystery of Il Carnivale - Venice's world famous annual carnival - to your own special occasion party. It is in Venice in Northern Italy where these authentic masks originate, and where they are still made today - each one is slightly different from the next - an individual party statement. Hand made with precision from laser cut metal, painted in gold, you can be certain to make a grand entrance to your party, ball or especially themed occasion. Beautifully decorated with real Swarovski crystals, sparkling for effect, they adorn the intricate filigree work to perfection. The mask is shaped to fit comfortably over your face and with satin ties will be secured in place giving you all-night comfort until the party is over. Nothing can match the true Venetian elegance designed in this mask. Flattering, sophisticated, glamorous and classy, this luxurious gold filigree design is everything you're looking for in a quality masquerade mask - your own masterpiece of Venetian vintage elegance. After the party you won't want to part with it - and there's no need for it will make a gorgeous souvenir for you to keep. Because each mask is beautifully crafted entirely by hand, every one is unique. Machine made masks are identical and mass produced while the hand made masks we offer are stunningly individual. 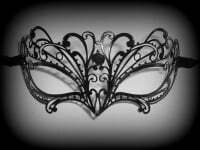 If you're looking for a special masquerade mask for your masked ball, wedding, fancy dress or themed party you'll love the beauty embellished in this mask. 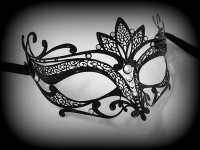 When you want to stand out from the crowd, to be dazzlingly different and effortlessly elegant, tie on your mask and enjoy the glamour and excitement made famous in the Venice Carnival yet here for you - Why not order yours today?